One of the best themes you could pick to truly spoil yourself is a Pampering Themed Break in Suffolk! The ultimate way to relax and indulge, there are a number of hotels and accommodation in Suffolk that come complete with a Spa and offer Complimentary Therapies and Beauty Treatments. The grand and charismatic Hintlesham Hall Hotel, Ipswich is the perfect place to pamper yourself into a state of extreme bliss! This 16th Century building, located within 175 acres of beautiful Suffolk countryside, has distinguishing Georgian features and thirty-three bedrooms that come in a wide variety of shapes, sizes and styles - each one being at the height of luxury. Hintlesham Hall offers wonderful Pamper Days in which you can choose three one-hour specialist treatments from the entire range, use the outdoor pool, tennis court and gymnasium, and enjoy a delicious three-course lunch. You are sure to leave Hintelsham Hall feeling fully refreshed, recharged and revitalised - and ready to take on the world once more! 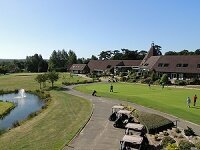 Two Hotels with their own on-site spas are The Stoke-by-Nayland Hotel, Golf & Spa and Ufford Park Hotel, Golf and Spa. Both of these hotels are set within picturesque and tranquil locations, offer a range of comfortable rooms (Ufford Park has rooms with balconies and views over the Deben valley and the on-site golf course), and have state-of-the-art Spas complete highly trained beauty therapists providing specialist treatments to arguably present two of the finest Pampering Break accommodation options in Britain. As their names suggest, there are also golf courses available for use to all visitors, whatever your golf experience. In Thorpe Le Soken a new concept has recemtly opened and is proving very popular. The Lifehouse Spa & Hotel is a luxury Spa with accommodation for adults only, and offers a unique experience with highly personalised, specialised and tailormade programmes to suit every guest's needs. Dedicated experts specialising in key areas such as fitness, life coaching, nutrition, weight loss, therapies and horticulture are on hand to make your break a memorable one. For more information on Health Spa and Pampering Themed Breaks, please see our list of Health Spa Hotels in Suffolk and our articles on Leisure Breaks in Suffolk and Suffolk Health Spas.